Apple this month filed two complaints against Graphics Properties Holdings Inc., through its attorneys George A. Riley and Ryan K. Yagura of the Los Angeles-based firm O'Melveny & Myers LLP. Details of Apple's patent infringement complaints, filed in U.S. District Court in San Francisco, remain unavailable for public viewing. All three patents were originally filed in the 1990s. Two of them are assigned to Silicon Graphics, while the '881 patent was originally issued to Cray Research Inc. of Eagan, Minn.
Apple was first sued by Silicon Graphics in November of 2010 and was originally accused of just violating the '327 patent. 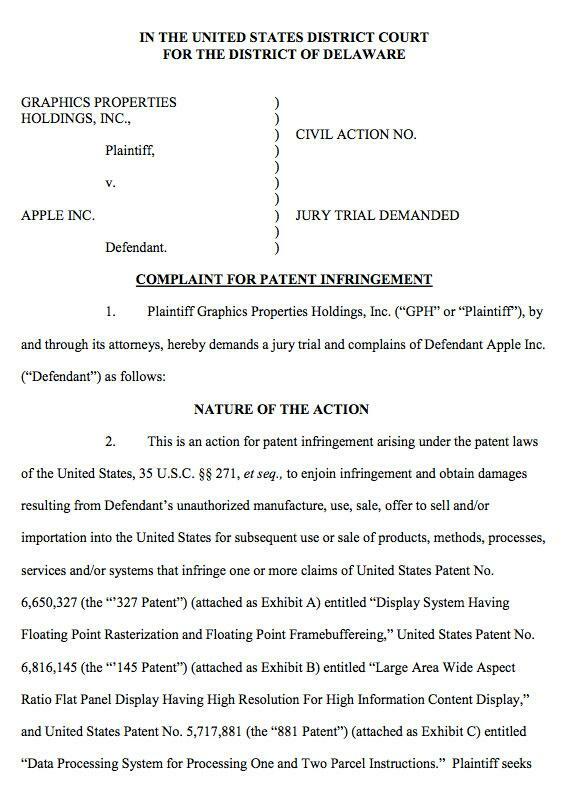 But last week's complaint, filed under the new name of Graphics Properties Holdings, adds the two additional patents. The latest lawsuit from Graphics Properties Holdings was preceded by a complaint with the U.S. International Trade Commission on Nov. 17. That wide-reaching lawsuit included Apple among a long list of defendants such as Sony, Samsung, LG, HTC and Research in Motion. The ITC complaint is also related to the same '327, '145 and '881 patents singled out in the U.S. District Court lawsuit lodged against Apple in Delaware. Graphics Properties Holdings noted that companies including Microsoft and IBM license its technology, and has requested that the ITC Commission halt the importation of products made by the accused companies.